Meet Julie: this young dog was rescued from Edgewood Park on Belfort off Telephone Road. She was taken to the vet and treated for mange, but she has now recovered and her skin and coat are very healthy. She is approximately 18 months old and weighs about 40 pounds. She is current on her vaccinations and has been spayed. She has tall ears like a German Shepherd, but also has some lab and terrier markings. 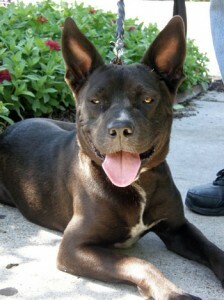 She is currently in foster care but needs a forever home. Julie is super sweet and lives for belly rubs! For information or to adopt Julie, contact Barrio Dogs at info@barriodogs.org. This young dog was found at Edgewood Park on Belfort off of Telephone Road. She was taken to the vet and she had demodec mange but after months of treatment she has recovered and her skin and coat are very healthy. She is approximately 18 months old, about 40 lbs. and up to date on all of her vaccines and has been spayed. She has very tall ears almost like a German Shepherd but then has some lab and terrier markings. She is in foster care but needs a forever home. Julie is SUPER sweet, very docile and lives for belly rubs.